Posted 8/11/2011 6:32am by Gregg Keckler. CANTELOUPE! LUNCH BOX MELONS! HACKACHU MELONS! PLUMS! We have MANY varieties of plums. Santa Rosa, Red Heart, Ozark and Shiro! PEACHES! FREE STONE peaches. Very Sweet! The first pears - KLAPP's Pears - Very nice pears! GREEN BEANS! and YELLOW BEANS! We will have HEIRLOOM TOMATOES - Purple Cherokee, pink Branywine, Germanhead, Lemon Boy, Beefsteak, Black Tula, and many others. Taste them and see if they are not the best tomatoes of the year! We have lots of cherry, grape, plum and SUN GOLD tomatoes! perfect for salads or on the grill! Email us if you would like to purchase large quanities of tomatoes for canning! We have ZUCCHINI, YELLOW SQUASH, and CUCUMBERS including lemon cucumbers. We have salad mixes, fresh herbs including BASIL and DILL! New red and white POTATOES! PORK - We have free-range pork for all occasions. Chops, 7 inch links for the grill, and our own pork bologna. This bologna is very smooth and deliciously sweet. PIES - blueberry pie, Raspberry pie and Peach pie - We have our own pies, sweet breads, honey and jams. Posted 8/10/2011 6:03am by Gregg Keckler. Several years ago, my friend gave me a great/ easy recipe for chard, so I am looking forward to it (even grew some last year). Roll your favorite cheese with a piece of pepperoni or salami into each leaf. Place rolls in baking pan. Cover with your favorite tomato sauce and sprinkle with mozzarella. Bake until cheese melted and bubbly. A sort of pasta-free manicotti I suppose. Even my husband loves it. Ps stems cut up make a great salad, or stir fry. Posted 8/8/2011 7:46pm by Gregg Keckler. a little sea salt... . I love this on my Wasa crispbread crackers or added as a condiment to fish, soup, etc. Posted 8/8/2011 9:03am by Gregg Keckler. 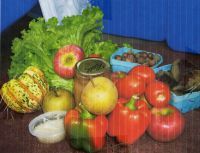 This week's shares will include: cantaloupe, peppers, tomatoes, plums, jam,. sweet corn, and a mystery item. We like giving the mystery item because it really helps us give different things to each group. This helps when we have just a few of some things. The peppers this week could be bell peppers or sweet banana peppers, but no hot peppers, yet. Use the tomatoes in everything. I made a very good tomato, onion, cucumber, and pepper salad using red wine vinegar, sugar, dill and oregano. These kinds of dishes don't require a lot of any one vegetable. The jam is made from our own fruit. Enjoy some of the mixed varieties that Gregg made this year. Our corn is a very good sweet corn. We pay a neighbor to grow the corn for us. We buy the seeds and he plants and maintains it for us. We have Incredible (a yellow variety), Mira (a bi-color variety), and Argent (a white corn) We love these variety. The are great sweet corn and will keep their sweetness for several days. Have a great week of good food. Posted 8/4/2011 6:07am by Gregg Keckler. PLUMS! We have MANY varieties of plums. Santa Rosa, Red Heart, and Shiro! Canteloupes! Very sweet! We have sugar baby WATERMELONS. KALE, COLLARDS, SWISS CHARD! Lettuce mixes! BLUEBERRY PIE and Peach PIE - We have our own pies, sweet breads, honey and jams. Posted 8/1/2011 10:04am by Gregg Keckler. The deadline to sign up of the fall session is September 2. If your business or neighborhood community would like to arrange a delivery - just get 6 subscribers for the same location and we will make a delivery. Let us know if you have any questions. Posted 7/28/2011 6:48am by Gregg Keckler. PLUMS! We have MANY varieties of plums. Santa Rosa, Red Heart, and Methley! Broccoli, Kohlrabie - great vegetables! Cherry Grape, and plum tomatoes are here. Sweet BANANA Peppers and bell peppers. We have ZUCCHINI, YELLOW SQUASH, and CUCUMBERS including pickling cukes and lemon cucumbers. We have salad mixes, fresh herbs including BASIL and DILL . KALE, COLLARDS, SWISS CHARD! PORK - We have free-range pork for all occasions. Chops, 7 inch links for the grill, fresh pork steaks, chops, and our own pork bologna. This bologna is very smooth and deliciously sweet. Posted 7/25/2011 9:18am by Gregg Keckler. Welcome to our summer CSA session. I had a few errors on my "CSA extras and stuff" email that you received last week. 1. Wednesday deliveries begin on July 27. 3. Add Colby Jack cheese @9.99/lb under cheese items. That you can order extras at any time to be included in your next delivery. We will keep a running total and send you a bill at the end of the session and then you can send a check. Tthis week's share will include: peaches, plums/apricots, bell pepper, new potatoes, yellow squash, tomatoes, Swiss chard, and cucumber. The peaches are free stone and delicious. If they are firm let them sit on your counter to soften them. If they are soft refrigerate then. The plums are Methley if they are light purple, Santa Rosa if they are red, and Shiro if they are yellow. New potatoes are perfect for the grill. I put them in the microwave for about 7-10 minutes and then put them on skewers and grill them basting with a mayo, garlic, and oregano mixture. I also did some creative grilling with squash. Try new things or make a different marinade for the veggies. I know some of you balk at Swiss chard. Try if in different ways - sautéed, steamed, put a leaf or two on a deli sandwich. Remember Americans seem to have developed an aversion to greens. Try to overcome it. If you don't think you or your children can handle a whole skillet full of Chard, just throw in a leaf or two in here and there. Even if the chard goes limp, it is still usable. Challenge yourself to use EVERY piece of it throughout the week. The cucumbers could be large pickling cucumbers or straight eights (the dark skinned ones). With all the heat and no rain the skins could be getting bitter, if you find them too bitter just peel them. The tomatoes this week could be any kind. We are picking heirloom tomatoes now as well as plum, grape, and cherry tomatoes. Every tomato is ripe and ready to eat regardless of color. We have purple Cherokee, black Tula, Germanhead, pink Brandywine, pineapple, Beefsteak, Pink girls and lemon boys big green giants and others. So enjoy these. DO NOT PUT TOMATOES IN THE FRIG unless you plan to make sauce with them. The temperature of the refrigerator is too cold for them. We converted an old milk house (where the milk cans were kept in a trough of cold water until the truck could pick them up) into a tomato house. We insulated the house (6x8) and installed an air conditioner set at about 60 degrees. The tomatoes love it! and sometimes we sneak in there ourselves since our house is not air- conditioned. We also have some extra items for sale if you are interested. Have a great week eating healthy! Posted 7/15/2011 9:04am by Gregg Keckler. Cover lentils with 2 cups of water, and boil 30 minutes, or until cooked. Posted 7/14/2011 6:15am by Gregg Keckler. PLUMS! Early Yellow and Methley! We will have HEIRLOOM TOMATOES - we just picked several flat of great BIG sweet tomatoes. The kind you remember growing up. Cherry tomatoes are here. We have ZUCCHINI, YELLOW SQUASH, and CUCUMBERS including pickling cukes. New RED and white POTATOES! Good Summer SWEET ONIONS! Nice green CABBAGE! Don't forget Swiss Chard, Collards, and Kale!